Did you miss the first day of this year’s Vancouver Resource Investment Conference? We run through key highlights here. This year’s Vancouver Resource Investment Conference kicked off on Sunday (January 20) with plenty of presentations from thought leaders, experts and companies. Held at Canada Place, the first day of the two-day event was well attended, and the Investing News Network team was busy throughout the day. Below we’ve put together some highlights from the first day. Scroll on to read more about what happened on the floor, and be sure to keep an eye out as we post interviews with some of the most knowledgeable analysts, experts and companies in the resource sector in the next few days. Day one started with a presentation by Frank Holmes of US Global Investors (NASDAQ:GROW), who talked about the main macro forces that could impact commodities this year. Next, Holmes and Marin Katusa of Katusa Research moderated a top picks competition with presentations by Eira Thomas of Lucara Diamond (TSX:LUC), Roy Sebag of Mene (TSXV:MENE), Denis Laviolette of GoldSpot Discoveries, Greg Smith of Equinox Gold (TSXV:EQX), Amir Adnani of Uranium Energy (NYSEAMERICAN:UEC) and GoldMining (TSX:GOLD), and Mike Davies of Gran Colombia Gold (TSX:GCM). 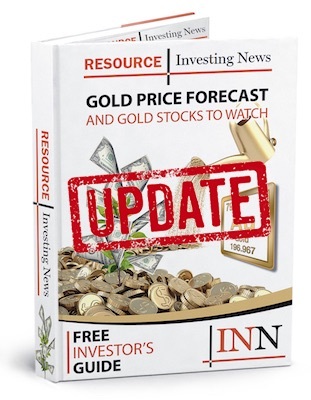 Following the competition, Holmes, Sebag, Peter Hug of Kitco Metals and Peter Schiff of Euro Pacific Capital answered questions from Daniela Cambone of Kitco Metals about gold’s future this year. The Ultimate Gold Panel is on now at #VRIC19 – Peter Hug comments on #gold‘s performance in Canadian dollar terms, says it’s proven to be an “excellent investment” over the last decade.
.@PeterSchiff mentions QE4, says it could launch a new bull market phase; he used to think #gold would hit $5,000 – now believes it could go further. Workshops conducted by David Erfle of Junior Miner Junky, Peter Spina of GoldSeek.com, Mercenary Geologist Mickey Fulp and Jeff Clark of GoldSilver.com were another highlight of the morning. Watching Peter Spina of @GoldSeekcom at #VRIC19 – says everything is in a bubble today (except commodities/precious metals), with the biggest bubble being the monetary system. After lunch, investors were ready to take in more talks, this time featuring Eric Townsend of Macro Voices, Jeff Klenda of Ur-Energy (TSX:URE), Andrew O’Donnell of Supercharged Stocks, Jeffrey Christian of CPM Group, Philip O’Neil of MP1 Capital and Gianni Kovacevic of CopperBank Resources (CSE:CBK). Another high note in the afternoon was a debate between Katusa and Timothy Sykes of TLC Media. Sykes became a self-made millionaire by the age of 21, trading thousands of penny stocks. Katusa asked Sykes about his strategies, what he thinks about the resource space and how mining can attract younger generations. Later in the afternoon, Rex Murphy of CBC and the National Post shared his thoughts on Canada’s resource economy. The day wrapped up with a panel moderated by Katusa featuring Brent Johnson of Santiago Capital, Townsend, Sykes, Murphy and Schiff. The discussion covered gold, the US dollar and oil, and what’s ahead for each space. The editorial team was busy conducting interviews with many of the speakers on day one, including Brian Leni of Junior Stock Review, David Morgan of the Morgan Report, US Global Investors’ Holmes, CPM Group’s Christian and many more. Follow along on Twitter on Monday (January 21) as we cover day two of the conference, and stay tuned as we begin to post video interviews and other coverage.